When I attended the First Coast Pastel Society plein air paint-out on April 7 I finished the previous painting I had posted fairly early in the day. So at that point I took a break and went for a walk around Washington Oaks to see where the other pastelists had set up, what they were working on, and to take a few photos to post on our FCPS blog. 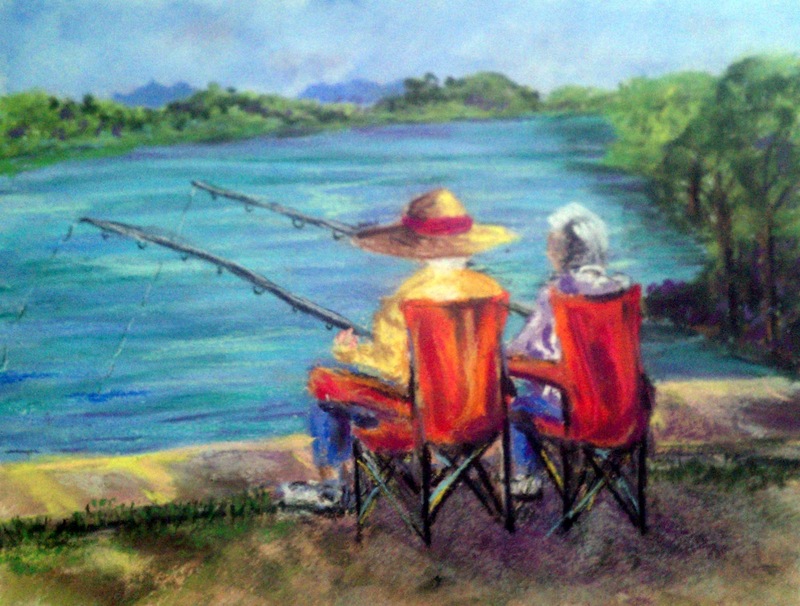 When I got back to the spot where I had my easel set up I found that a couple women had set up their chairs almost right next to me and were fishing. Since I had finished my first painting and was looking for a vantage point to paint another I decided that rather than move my easel and pastels and all my gear I would just stay where I was and try to paint the two women! It was fun. Painting people is harder than scenery of course, especially when they don't know they are being painted and, unlike professional models, keep moving around and shifting position, LOL. But I had fun working on it, and just made a few touches in my home studio this morning so I could put it up on this blog. And the two women got a kick out of it when they saw what I had done.